Whenever I feel anxious or stressed out—whether it’s about something in particular, or the overwhelming feeling that something isn’t quite right—I clean, organize and simplify. Inserting literal order into the space around me brings a sense of calm and peace into my life, and makes whatever else is going on around me seem a bit smaller and less daunting. Plus, my house gets really clean. During my last reorganization effort, I cleaned and straightened my kitchen cabinets, which were crammed with numerous and multicolored bulk item containers. I separated the fully filled containers from the containers that held handful-sized amounts to use up throughout the week. Among these were green lentils, walnuts, pistachios and sesame seeds that I decided I wanted to turn into falafel. I mean, fauxlafel. 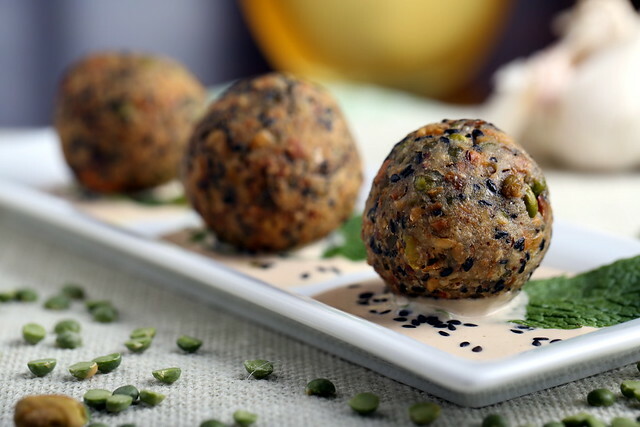 But would the green-lentil-based batter adhere like traditional falafel, and hold up to frying and yield a crispy outside, with a soft and pillowy inside? Yes, yes and yes. 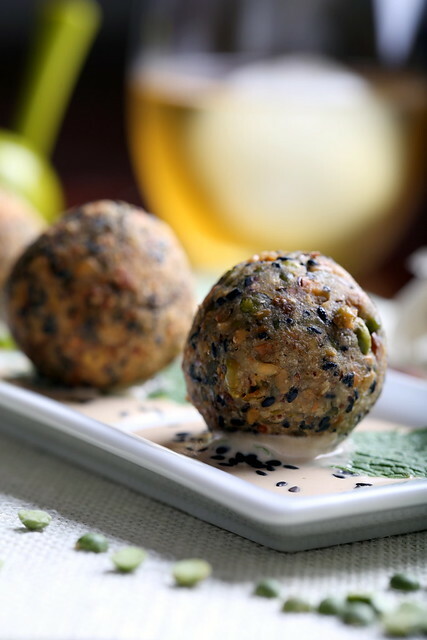 These mint-kissed and motley-textured spheres offered a nice spin on the traditional version with a crisp pop of flavor and subtle crunch throughout. Serve by themselves with an apple cider vinegar-spiked tahini or pack into a pita with some extra fresh mint for a clean and colorful bite. Whisk together all of the sauce ingredients and place in the refrigerator to chill. Place the water in a small to medium-sized pot or saucepan and bring to a boil. Add in the lentils and keep at a low simmer, uncovered until al dente, about 15 minutes. While your lentils are cooking, place the walnuts and pistachios in a dry, flat-bottomed pan. Toast over medium heat for just a few minutes, stirring to ensure they do not burn. Transfer to a food processor and pulse a few times until they are roughly chopped. Scrape the chopped nuts into a large bowl, then add in the garlic, mint and sesame seeds, stirring well. Whisk together the rest of the fauxlafel ingredients* and add to the mixture, stirring well. *Only add in the baking powder if frying right away—otherwise, add it later to the cold mix right before frying. By now, your lentils should be done. Pull a couple from the water and test them to ensure they are al dente. Strain the water, then transfer the lentils to the food processor and pulse several times to achieve a rough chop. Transfer the warm chopped lentils to the bowl and stir well. Pull a golfball-sized amount of the mixture and form a sphere with it, first buy cupping your palms together and slightly squeezing it into a sphere. Once it is firmly packed, then lightly roll it between flattened palms to create a smooth sphere. You may need to add a few splashes of water and sprinkles of flour as needed to the mixture to achieve a cohesive consistency. Place several inches of grapeseed or canola oil into a small saucepan over medium-high heat. After about 7 minutes, throw a pinch of batter into the oil—if it sizzles immediately, you are ready to fry. You can also heat to 350 degrees with a thermometer if you like. Fry 3-4 spheres at a time for about 4 minutes, or until golden brown. Remove from the oil onto paper towels and sprinkle with a little salt immediately. 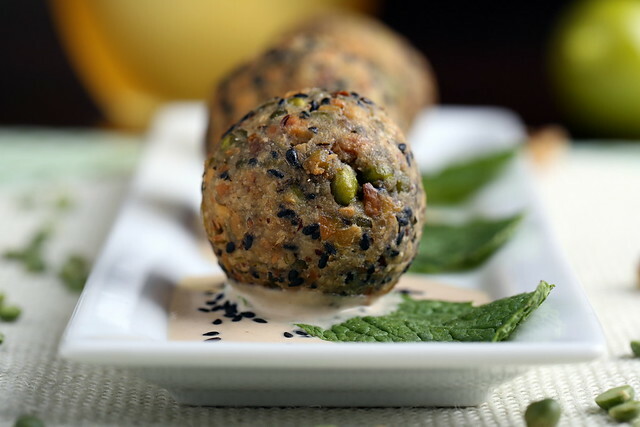 Serve the fauxlafel with the tahini sauce (add a little water to thin it out as desired), sprinkled with extra sesame seeds and garnish with fresh mint leaves. i organize when i'm feeling out of control, too. even if i'm a wreck, my house is clean! i love these fauxlafel! i love lentils and walnuts together. This looks so elegant and it sounds amazing! mmm these look so good! yum! good idea to mix it up a bit on the falafel theme (not that there is anything wrong with a perfect falafel, though!) 🙂 I also like to tidy when I am feeling stressed. Somehow it gives me the illusion of control. ha! I may try to make a baked version of these! But, I'd have to shell some pistachios. Oh, darn. 😀 They sound so delicious! Wonderful, wonderful! I made these the other night as a double batch so I could share it with my family and have some leftovers. I love how the ingredients in these spheres meld and shape so perfectly! I was hesitant with the mint because I wondered if it would be overpowering, but it wasn't. Instead, it was a subtle hint of cool freshness. I actually forgot to get pitas, so I served them on large soft tortillas with a generous layer of arugula and the tahini sauce–folding like a wrap. I love that when I make your recipes, my results look like your pictures which doesn't always happen with other cookbooks and recipes. So happy you enjoyed, Leila! Thanks for sharing it with others, and serving it with arugula/tortillas sounds nice. I will have to try that next time I make a batch! That is an interesting combination. Hmm, wonder what it taste like.